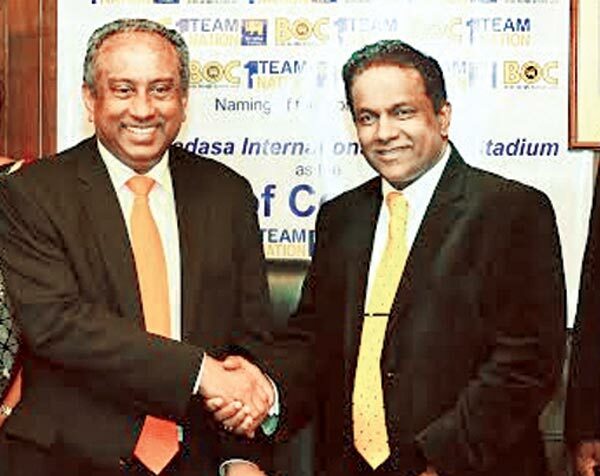 The signing of the agreement to name R. Premadasa International Cricket Stadium’s north sight screen as the “Bank of Ceylon end” took place at the headquarters of Sri Lanka Cricket. The agreement was signed by the Bank’s chairman, President’s Counsel Ronald C. Perera, Director Ranel Wijesinha and General Manager D.M. Gunasekera on behalf of the Bank. The president of Sri Lanka Cricket Thilanga Sumathipala graced the occasion with vice president K. Mathivanan and secretary Mohan de Silva who signed on behalf of SLC.